No room in your home sees more daily traffic than the bathroom. Morning, noon, and night your family needs access to a space in which they can relax and feel comfortable. If your bathroom is cramped or outdated, then the bathroom experience will not be a positive one. By remodeling your bathroom with G.M. Roth, you will be able to maximize space, comfort, and value in one easy to manage project. Contemporary trends in bathroom design have come a long way from the mundane designs of the ’80s and ’90s. Installing bold lighting fixtures, intricate stonework, and elegant sinks and bathtubs are just a few of the ways to bring modern flare to your bathroom remodeling in Massachusetts or New Hampshire. Check out our Bath Trends/Ideas page for the latest in bathroom remodeling. Even with bold new designs, it has never been easier to remodel a bathroom for more space and easier access. G.M. Roth will oversee every aspect of your Massachusetts area bathroom remodeling project, including plumbing, electrical, flooring, walls and finishing, to ensure that your are left with a spacious, comfortable, practical new space. We understand the stress a bathroom remodeling project can put on a family, especially if you only have one bathroom in the home. That is why we at G.M. Roth do all we can to avoid lengthy disruption, minimizing your inconvenience when the room is out of service. Our expert crews will work quickly, without sacrificing detail or quality, in order to get your remodeled bathroom up and running as soon as possible. As with all of our services, every product we use in your Massachusetts area bathroom remodeling project is backed by an industry-leading warranty and installed by a fully licensed, factory trained professional. 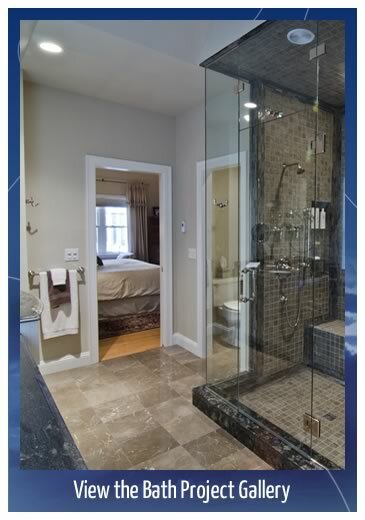 For full details on our bathroom remodeling services, call G.M. Roth or visit our Contact Us page to request a quote today! Our team can make your dream come true, faster and more affordably. Call G.M. Roth Design Remodeling today at (603) 880-3761 to schedule a complimentary in-home consultation with one of our talented designers.